Proxima Centauri is a star in the main sequence of very low mass; a so-called M dwarf or red dwarf. Let me introduce this population of stars. Red dwarfs are the most common in the solar vicinity and in the Galaxy. They outnumber the stars similar to the Sun by a lot: about 70% of the total stars in the Milky Way are M dwarfs. They are also fainter optically, so that none of them can be seen with the naked eye, even if they are closer than 10 light-years from our solar system. M dwarf stars cover a range in mass from 0.08 to 0.5 solar masses, and are roughly classified from M8 to M0 depending on their spectral properties. In this range, their effective surface temperature grows from 2,300 to 3,500 Kelvin, their radius from 70,000 to 370,000 km and their luminosity from 1/10,000 to 2/100 the solar luminosity. As they consume their hydrogen more slowly than more massive stars, their lifetime is longer and thus, most of our red dwarf neighbors are old stars. Searching for exoplanets specifically around red dwarfs has been a trend for a long time. First, because the low stellar luminosity and the proximity to Earth make them good targets for direct imaging, a technique where contrast and angular separation are the limiting factors. Second, for the more favorable conditions which exist for indirect methods: for a given planet mass or radius, the signal expected from the planet is larger when this planet orbits a low-mass, low-radius star. The radial-velocity semi-amplitude expected from a planet orbiting a Proxima-Centaurus like star is 4 times larger than if the same planet, with the same orbital period, orbits a Sun-like star. 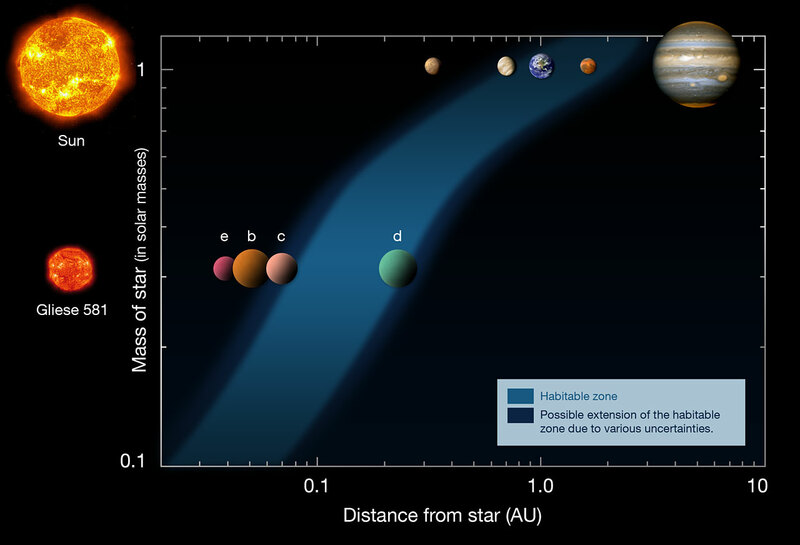 And third, the habitable zone of a red dwarf corresponds to short orbits of several weeks to months (compared to typically one year for the Sun). So anyone searching for small planets in the habitable zone of a star would search around red dwarfs, just for the sake of boosting the signal over the ever-present instrumental and stellar noise. Well, what about the stellar “noise” of red dwarfs, or rather, their magnetic activity? Such subjects are still open to active research and lively debate. Activity is characterized by many related phenomena: spots, magnetic field, rotation, convection, chromospheric flares, granulation, and oscillations… The first—spots—has the most immediate effect on the star: the stellar surface is not homogeneously bright, but spotted with dark features whose lifetime, location, contrast and size may vary strongly from star to star and which rotate at the star spin rate—50 to 100 days is a typical rotation period for an M dwarf. This timescale is, unfortunately, very similar to the period of a planet located in the habitable zone of such a star. This makes room for mistakes. A 50-day rotating star with two main spots separated by 180o would have a radial-velocity curve quite similar to a non-spotted star with a low-mass planet in a 50-day orbit. Such ambiguous configurations have happened in the past and were resolved by additional diagnostics of activity. But were they all found and solved? Artist impression of an active red star orbited by an exoplanet. This star has a huge stellar spot and several surface eruptions, both phenomena evolving with time: how can we distinguish the tiny planet signal, with variations on similar timescales? Credits D. Aguilar, CfA. Activity in a more general sense evolves over the lifetime of the star and depends on its mass, which controls the depth of the external convective envelope where many of these mechanisms emerge. The range of M dwarfs contains an interesting boundary where a star can have a partially convective envelope and a radiative core (if it is above 0.35 solar masses) or a fully convective structure (if of lower mass). The dynamo mechanism, the origin of most activity features at the surface of a star, is altered by various convection conditions; magnetic topologies of red dwarfs are strongly different from solar-like topologies. This research, led by Julien Morin and Jean-Francois Donati, is still in their infancy (with about 20 M-dwarf stars for whose magnetic topology is characterized so far), but promises to reveal much about stellar activity phenomena and their impact on exoplanet searches. I mentioned earlier that none of the red dwarfs, although so close-by, were visible with the naked eye. Isn’t that a bummer for observation? 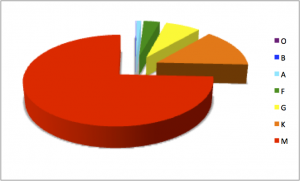 Searches for tiny signals usually crave photons, many photons, as many as possible. So is it feasible to get enough photons from red dwarfs to search for planets anyway? HARPS observes in the optical domain and it is clear from previous results, from Xavier Bonfils and his team, that at least some red dwarfs are bright enough to unveil their super-Earth exoplanets companions. But most of them will be too faint, especially the least massive ones. The peak of their emission lies at longer wavelengths, and it is far more favorable to observe red dwarfs in the near-infrared domain, at wavelengths up to 2-3 microns. This spectral domain offers other challenges, like detector sensitivity, but again, this is not the extreme 10cm/s level that is at stake here, but the 1m/s precision level. New instruments are coming online aiming at this radial-velocity precision in the near-infrared, precisely to explore the vastly unknown world of red dwarf exoplanet companions. As I write, on the slope of the Maunakea Observatory in Hawaii, we are awaiting one of these new instruments. 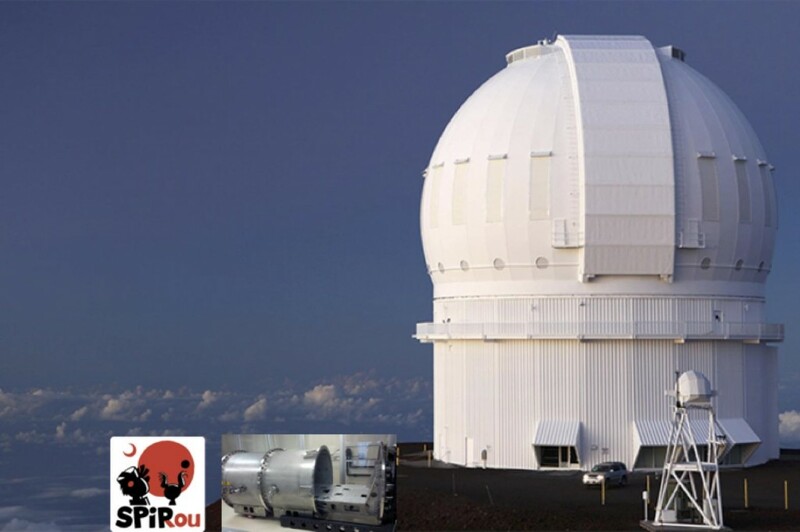 SPIRou will be mounted on the Canada-France-Hawaii 3.6m Telescope (CFHT) located on top of Maunakea. It will be the first planet-hunting instrument of CFHT. SPIRou combines the near-infrared domain, necessary for M dwarf studies, with the “radial-velocity-spectropolarimetric” capability of its spectrograph. It will be able in a single glance, to get a precise radial velocity of the observed star, and its instantaneous magnetic imprint. By monitoring stars over their rotation and planets along their revolution, the SPIRou team will be able to disentangle stellar activity and planet signals from the very direct diagnostics of the ultimate culprit, the magnetic field. It is not as easy as it may sound, though. The magnetic field can trigger multiple phenomena at the same time—say, a large rotating starspot and a short-lived chromospheric flare—while the SPIRou measurement will record an average of the stellar surface and lose the important spatial information. We only have spatial information available for our Sun—all other stars are point-like and their mean activity is the only feature we can try to correct for. Regardless, SPIRou will combine the Zeeman effect (distortion of stellar lines due to the magnetic field) with the Doppler effect (spectral shift due to velocity) and enhance the detectability of habitable Earth-like exoplanets. In a few years, it will observe the most nearby red dwarfs and search for their Earth-like companions. Keep tuned! The Canada-France-Hawaii Telescope located ontop of Maunakea in Hawaii, future host of the SPIRou near-infrared spectropolarimeter. Credits: Claire Moutou. Claire Moutou is a resident astronomer at Canada-France-Hawaii Telescope (CFHT) in Hawaii since 2013 and a director of research for the French Centre National de la Recherche Scientifique (CNRS). 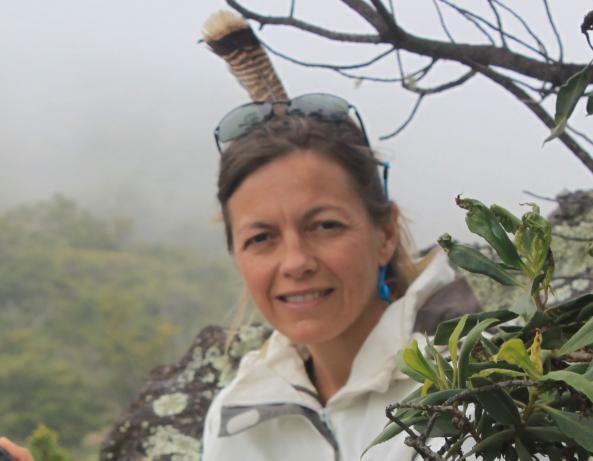 After a PhD thesis in Paris, she has been working in Observatoire de Haute Provence, European Southern Observatory and Laboratoire d’Astrophysique de Marseille. She has been involved in the search for planets using various methods, from space transits with the European mission CoRoT, to radial velocities with HARPS and SOPHIE, and direct imaging with the ESO/SPHERE instrument. She has explored observationally the interactions between stars and planets in extremely close orbits and the magnetic properties of stars hosting planets. 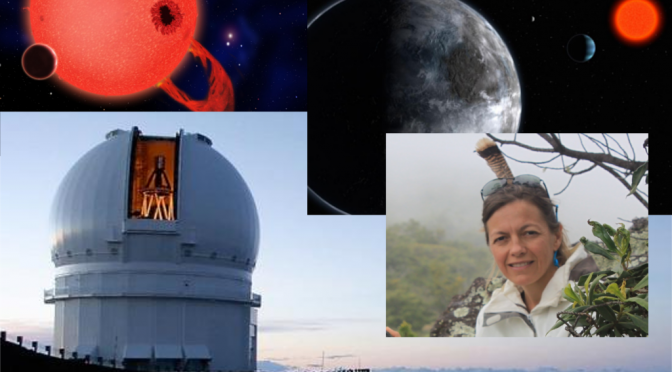 Since 2013, she is the CFHT Observatory Scientist of the SPIRou instrument.